, an Italian naturalist, more generally known by the name of Janus Plancus, under which he published several works, was born Jan. 3, 1693, at Rimini, where he died Dec. 3, 1775. 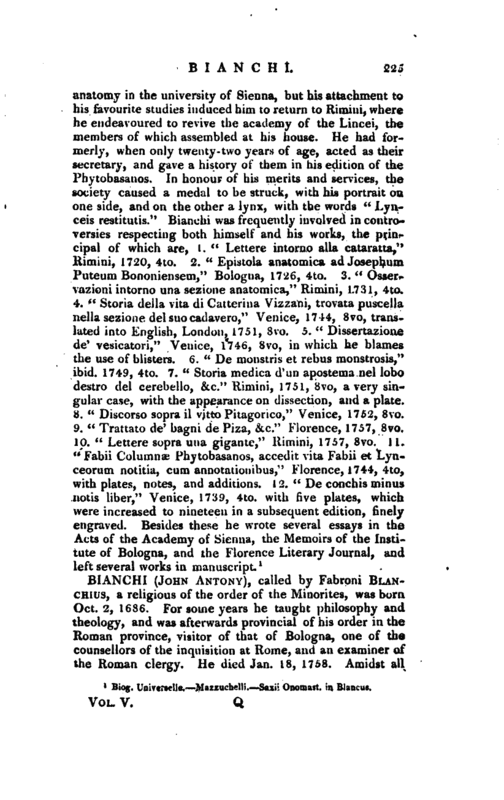 In 1717 he went to Bologna, and studied botany, natural history, mathematics, and natural philosophy. Having taken the degree of doctor in medicine in 17 19, he returned to his country, but afterwards resided for some time at Bologna and Padua before he settled and began practice at Rimini. Here also he improved his acquaintance with botany, and in his different tours accumulated a very fine collection of specimens of natural history. 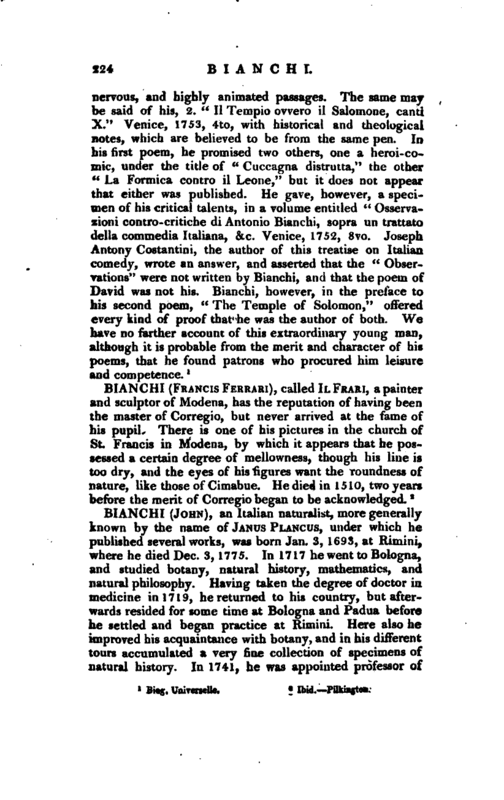 In 1741, he was appointed professor of | anatomy in the university of Sienna, but his attachment to las favourite studies induced him to return to Rimini, where he endeavoured to revive the academy of the Lincei, the members of which assembled at his house. He had formerly, when only twenty-two years of age, acted as their secretary, and gave a history of them in his edition of the Phytobasanos. In honour of his merits and services, the society caused a medal to be struck, with his portrait on one side, and on the other a lynx, with the words ~“Lynceis restitutis.” Biarichi was frequently involved in controversies respecting both himself and his works, the principal of which are, 1. “Lettere intorno alia cataratta,” Rimini, 1720, 4to. 2. “Epistola anatomica adJosephum. Puteum Bononiensem,” Bologna, 1726, 4to. 3. “Osservazioni intorno una sezione anatomica,” Rimini, 1731, 4to. 1 Biog. UniYenelle, Mazauchelli. Saji: Onoraast. in Blancus.